EUR/USD popped up from that short-term trend line on the 1-hour forex chart that I showed y’all a few days back, but it seems that the pair is just on its way to test yet another falling trend line! The pair might pull up to the trend line connecting the highs on the 4-hour time frame, as price is moving close to the 38.2% Fib. 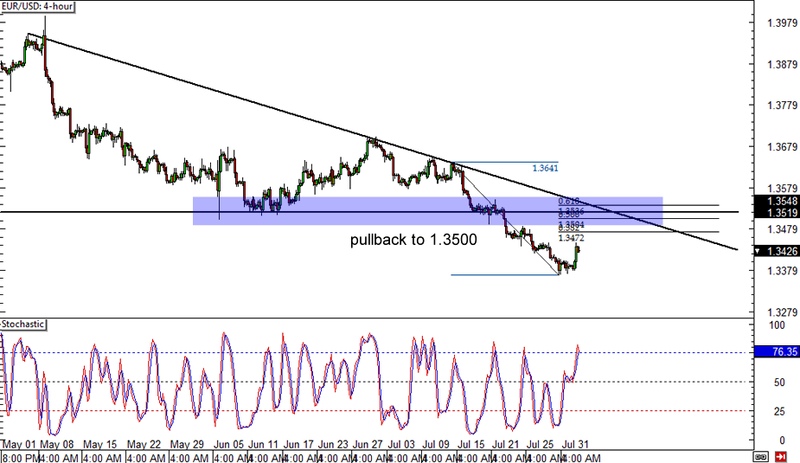 The 50% level lines up with the 1.3500 major psychological mark and is closer to the trend line, which suggests that this might act as resistance for any EUR/USD rallies. Stochastic just reached the overbought zone and has yet to cross down before the downtrend resumes. Ready to bounce? After testing the resistance at the top of the ascending triangle on its 4-hour forex chart, AUD/JPY is making its way down to the bottom of the triangle. Another bounce might be in the cards if the 95.00 handle holds as support, as stochastic is already moving out of the oversold zone. 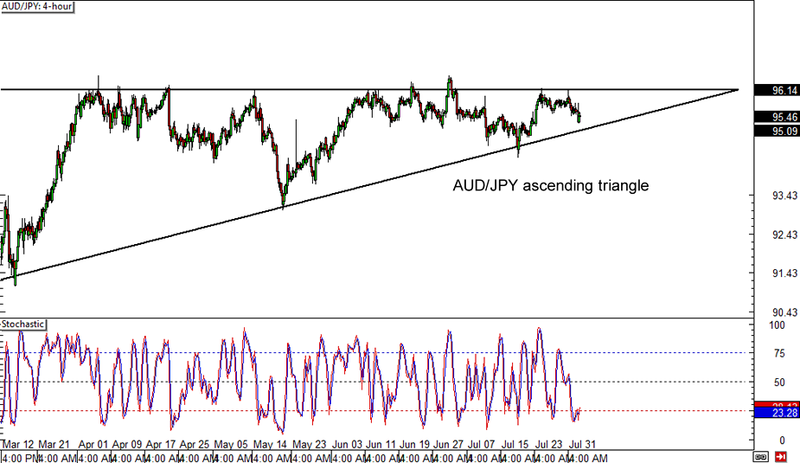 In that case, AUD/JPY might make a move back to the top of the triangle near the 96.00 mark. If selling momentum is strong enough though, a downside break from the triangle might take place and push the pair lower by as much as 500 pips, which is the same height as the chart pattern. 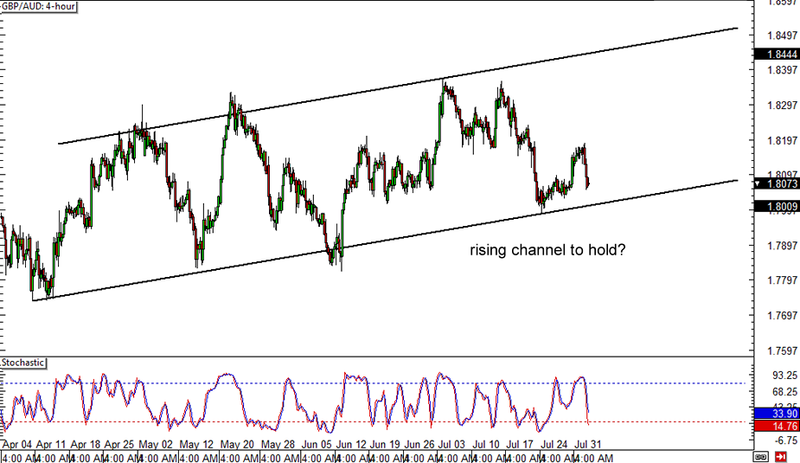 It seems like the bottom of the rising channel on GBP/AUD’s 4-hour forex chart held recently, but the pair might make another test just to be sure. Price barely made it to the middle of the channel before heading back down to the bottom, possibly to see if the 1.8000 major psychological handle will continue to hold as support. Stochastic is moving towards the oversold area, suggesting that there’s enough energy for sellers to push the pair down. If the 1.8000 level breaks down, a reversal might be in the cards and GBP/AUD could make its way down to the next support area at 1.7800.